Play your cards by trumping the piles with higher numbers, and colours! Only the first player out will score! Action and Condition cards change the rules of the game, and your strategy! 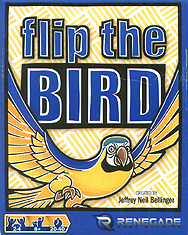 Don't get frustrated if card piles get too high, just Flip The Bird!